The term “Christmas tree syndrome” kind of sounds like someone is describing the special brand of sadness that comes with packing away seasonal decorations for the year — but the reality of Christmas tree syndrome is much more uncomfortable.If you notice that you or someone in your family has started coughing and sneezing since you put up your Christmas tree, the cause could be Christmas tree syndrome, an allergic reaction to mold spores that hang around on live trees. It causes an upper respiratory reaction and can become quite severe. It’s hard to believe a beautifully trimmed tree that fills your home with the smell of fresh pine could make your family sick, but it’s not a totally uncommon occurrence. I have always felt run-down during December. This malaise would start two weeks before Christmas, around the time my husband and I would normally haul a live Christmas tree into our house. My symptoms — a runny nose, sneezing, sinusitis and overall fatigue — would intensify, sometimes dramatically. But I chalked it up to the general excitement of the holiday season. Then two years ago on Christmas Eve, I became inexplicably fatigued after an evening sitting by the tree. The next day, as we exchanged gifts by the tree, I experienced a seismic allergy attack. 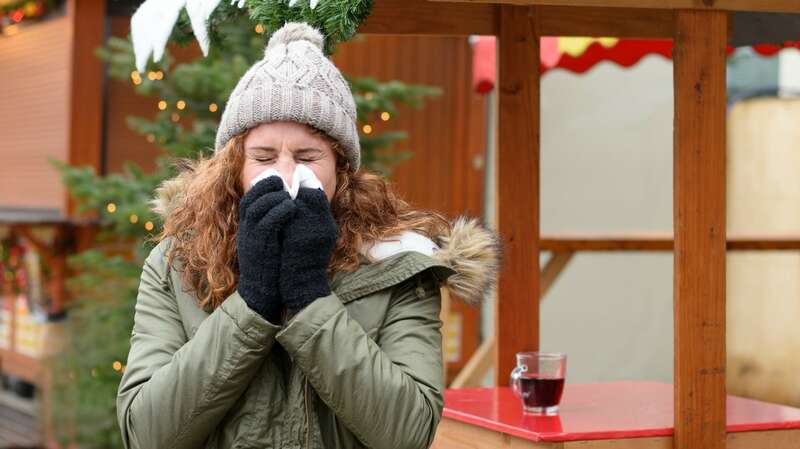 My nose began running like Niagara Falls, turning redder and more swollen than Rudolph’s, and my sneezing escalated in frequency and intensity, becoming alarmingly violent and convulsive. When I stepped outside, however, all of these symptoms immediately disappeared, forcing me to accept the grim conclusion: I was allergic to live Christmas trees. Turns out I’m not alone. “In my many years of private practice, I might see up to 10 kids on Christmas Eve or Christmas Day, who needed to go to the emergency room because they were having an asthma attack,” Dr. Lawrence Kurlandsky, a pediatric allergist and pulmonologist for more than 35 years and a former faculty member at SUNY Upstate Medical University in Syracuse, New York told SheKnows. Curious about the dramatic uptick in respiratory illnesses across all age groups around Dec. 25, Kurlandsky asked his colleagues at Upstate Medical University to bring in clippings of pine needles and bark from the live Christmas trees they had in their homes. The results, published in the Annals of Allergy, Asthma and Immunology, revealed that 53 different kinds of mold were present on 26 samples. According to the study, most of the molds identified were allergens that can potentially trigger allergic reactions, such as wheezing, coughing and sneezing. Kurlandsky’s findings also referenced a 2007 Bridgeport, Connecticut, study, where researchers tracked mold growth of a single live Christmas tree in a Connecticut home. What they found: The longer the Christmas tree remained in the house, the higher the mold spore count. Between Dec. 24 and Jan. 6, the number of airborne mold spores increased exponentially, from 800 spores per square meter the first three days (spore counts of less than 1,000 are considered “normal”), to 5,000 spores by day 14. Hot lights and central heating also facilitate mold growth. “Most of these molds tend to grow on dead leaves and dead plants in the fall, and then they give off their spores. Cladosporium counts can be a tremendous presence and trigger allergic reactions,” said Kurlandsky, who also recommends that children who have had a respiratory illness during previous holiday seasons be tested for mold sensitivity. Thoroughly wash your tree and let it dry — outside or in the garage — before bringing it into the house. “Be careful not to leave it outside for an extended period of time because things will start growing on it again,” said Kurlandsky. Depending on where you buy your tree, check to see if tree-washing services are available. Opt for an artificial Christmas tree. Wash it down or clean it using a compressed air duster, because artificial trees can also introduce dust and mold, depending on where and how they are stored. Clean all ornaments and lights before trimming your tree; they are dust and mold magnets! After Christmas, store decorations in plastic containers that can be easily wiped down since cardboard attracts dust and mold. Run an air purifier in the same room as the Christmas tree. It may help alleviate symptoms. Minimize exposure. Keep a live Christmas tree in the house no more than four to seven days if you’re sensitive to molds, suggests Dr. Phillip Hemmer, a co-author of the Bridgeport Christmas tree study.